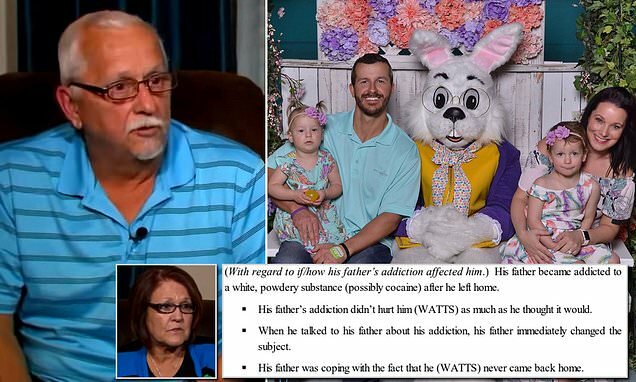 Chris Watts opened up about his childhood and the strained relationship between his parents and wife Shanann while speaking with authorities from prison last month. The convicted murderer said that his wife believed that her mother-in-law wanted to kill their daughter following an incident where she served ice cream with peanut chips to Bella, who had a nut allergy. Watts went on to confess that this may have motivated him to murder the pregnant mother of his children, though he still maintained that his decision to strangle Shanann was in no way premeditated. He told investigators that his parents, Cindy and Ronnie Watts, encouraged him argue he was a victim of emotional and mental abuse when the case went to trial, though it is unclear if they still believed their son’s claim that it was Shanann who killed daughters Bella, 4, and Celeste, 3, at that time. That substance was 'possibly cocaine' according to the report, and Watts said it did not bother him as much as he imagined it might at the time. 'When he talked to his father about his addiction, his father immediately changed the subject,' reads the report. This all caused added tension to the family's already crumbling relationships. 'His mother initially believed his father was having an affair because he couldn’t account for missing money,' the report goes on state.